Bangladesh is in the process of transition from a predominantly agro-based economy to a modern time-befitting one. There has been a considerable change in global flows of trade and finance including a surge in Foreign Direct Investment (FDI). Several underlying factors have contributed to increasing the economic progress in Bangladesh. These are balanced trade and exchange rate liberalisation, current account convertibility, prominence on a private sector led development, liberalisation of the investment regime, opening up of infrastructure and services to the private sector– both domestic and foreign, and above all the growing interest of foreign investors in energy and telecommunication and other emerging sectors. Every major economic research suggests that Bangladesh has been a golden land in terms of doing business; and people of the land are satisfied enough with the pace of progress and development. The Economic Conditions Report 2014 of Pew Research Centre (a Washington-based research organisation) found that 71 percent of the Bangladeshis are happy with the economic health of the country, while only 28 percent dissatisfied. The numbers reveal that majority of Bangladeshis have expressed optimism about the economy, giving the thumbs-up to the government’s economic management. 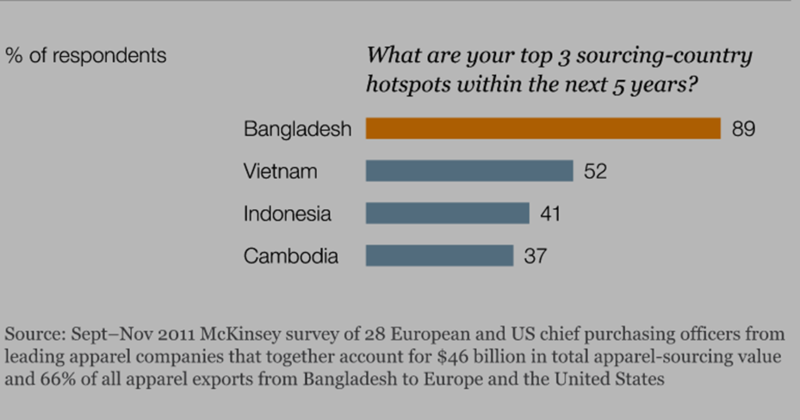 A staggering 66 percent of the respondents said they expect the economic situation in Bangladesh would improve over the next 12 months, while 22 percent said the situation will remain the same. One in 10 respondents said the economic situation will worsen. A lack of job opportunities in the country worries 70 percent respondents. There is, however, low concern about income inequality as only 34 percent Bangladeshis saw the rich-poor gap as a major problem. Apart from Bangladesh, the poll was conducted in eight other developing countries: Ghana, Kenya, Senegal, Nicaragua, Uganda, Tanzania, El Salvador and Palestine. It should be noted that in most nations, people say their country is heading towards the wrong direction and most voice the view that economic conditions are bad. – The per capita income and per capita GDP stands respectively at US$ 1190 and US$ 1115. – Yearly development expenses have been constantly increased. This has been increased to 8.8billion in 2013-14 fiscal year from 3 billion dollar in 2007-08 fiscal year. – Annual Development Programme (ADP) implementation rate has been increased to 97%. – Revenue has been doubled. – Foreign reserve has been increased. Bangladesh has been able to achieve 16.22 billion dollar, which is a record in the history of Bangladesh. – Budget deficiency is now 5 % less from the GDP. – Poverty rate has been decreased to 26% from 40%. – Per capita income has been increased from 630US$ to 1044US$. Export earnings showed an increasing rate in FY 2012-13 for especially increasing export in the non-traditional markets. 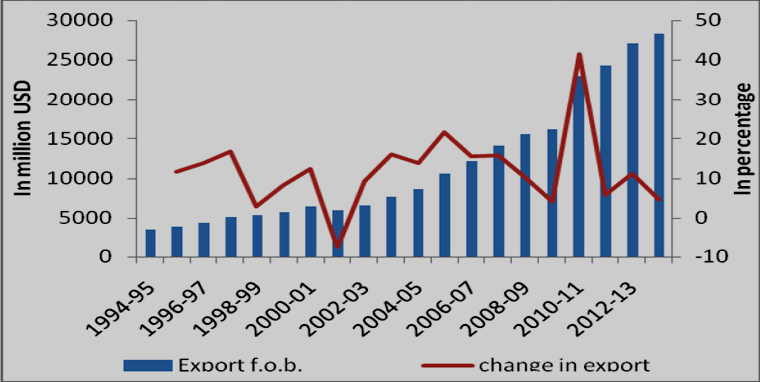 Moreover, export earning is increasing from FY 1994-95 to FY 2012-13, although at a discontinuous way. In FY 2012-13, export earnings were USD 27028 million which was 11.21 percent higher than that of the previous fiscal year. According to a provisional estimation, Bangladesh Economic Review, 2014 shows that the domestic and national savings stand at 23.43% and 30.54% respectively in FY 2013-14. These numbers stood at 22.40% and 30.53% in the previous FY of 2012-13. Investment in the FY2013-14 stands at 28.69% in which private investment contributes 21.30% and public investment contributes 7.30%. In FY2013-14, the target for revenue receipt stands at US$ 20194.8 million (11.6% of GDP) of which National Board of Revenue (NBR) tax is accounted for US$ 1611 million, non-NBR tax is accounted for US$ 667.44 million and non-tax revenue is US$ 3414.92 million Till March, 2014, total revenue receipts stands at US$ 1270 million, which covers 63% of the target. Total remittance in FY2013-14 stands at US$ 14.22 billion. 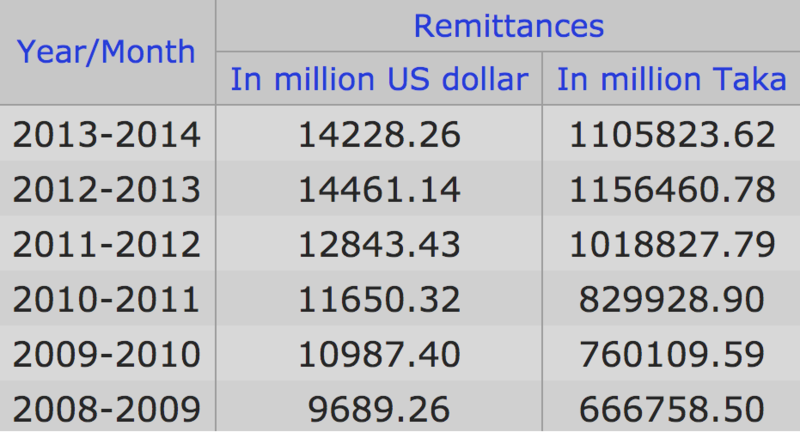 Recently, World Bank has ranked Bangladesh as the eighth remittance receiving country in the world in 2013. In recent fiscal year, 296,000 Bangladeshi went abroad which makes the total of 2.35 million of expatriates. Keeping the original trend, remittance inflow is on the rise from Malaysia, Singapore, United Kingdom and many other countries. Remittance inflow and declining rate in import payment flourished the foreign exchange reserve by 47.77 percent in FY 2012-13 than that of the previous fiscal year. In FY 2012-13, reserve was USD 15315.78 million which was USD 10364.40 million. According to the central bank, bumper rice production and stable prices of fuel oil and other importable products in the international market have helped rise in the foreign exchange reserve, Bangladesh has the second-highest foreign exchange reserves among the South Asian countries after India. 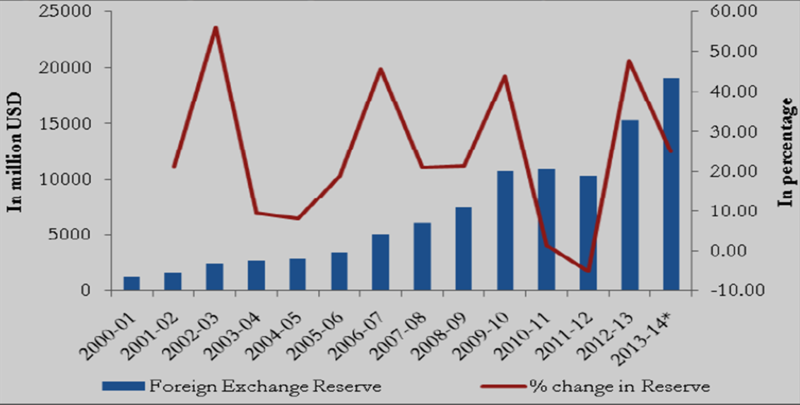 The foreign exchange reserve of India and Pakistan stood at USD 275056 and USD 10029 million respectively in February of 2014. [iii]According to Bangladesh Bank, till August 2014, reserve stands at US$ 22.09 billion. The World investment Report released recently by UNCTAD (United Nations Conference on Trade and Development) shows Bangladesh is placed as a second favoured investment destination in South Asia after India, which got US$ 28 billion. Pakistan stood third with US$ 1.3 billion pouring in as FDI. 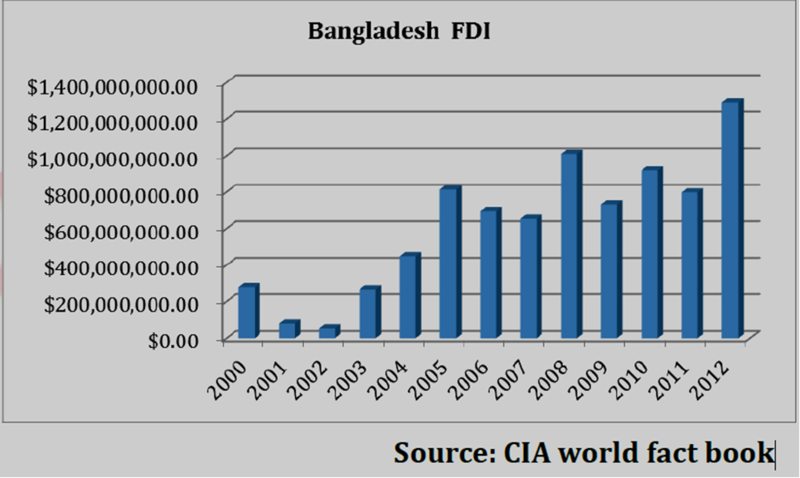 Inflows of FDI into Bangladesh rose 24 per cent year-on-year to US$ 1.6 billion in 2013. 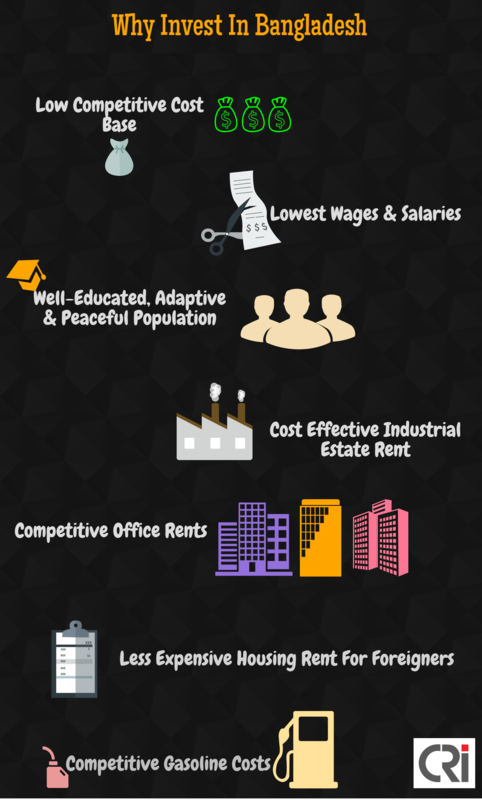 – Industrial estate rent in Dhaka is cost effective than Shanghai, Jakarta, Bangkok. 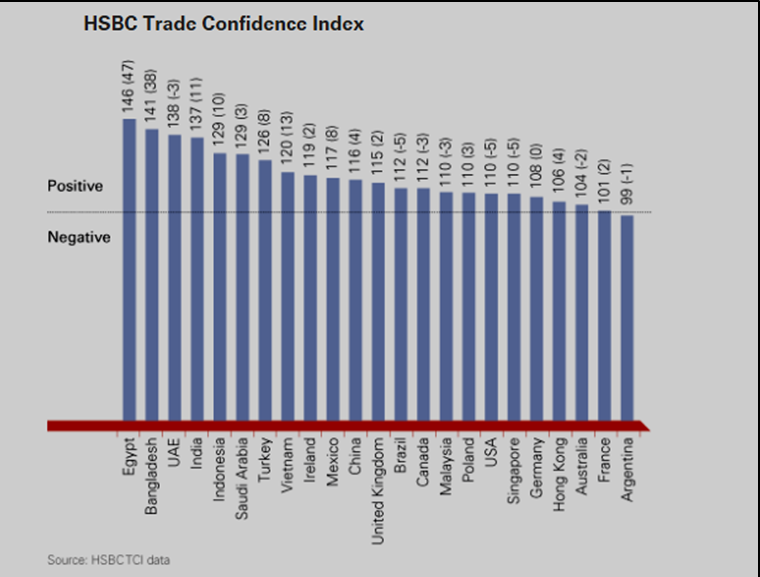 HSBC’s latest Trade Confidence Index, which was published 15 September 2014, shows that Bangladesh’s trade confidence rose sharply by 38 points in six months, which is the second highest among 23 countries globally. The jump was due to growing demand for its garments from Western buyers and the recent initiatives aimed at making the country’s apparel factories safer. On the longer-term outlook on Bangladesh, HSBC expects the country to grow rapidly over the remainder of the current decade, and investment, particularly in infrastructure, will continue to rise strongly to support this.